Instead, use them to your advantage. “To everything there is a season….” If you have been in practice for a while, at least you are vaguely aware there is a rhythm to the year. Tuning into these rhythms can help you manage your time, talents, and resources and add to your bottom line. It also can help your peace of mind. For example, I have noticed that every year I get lots of calls in May and September from dentists saying, “My schedule really feels light. Is it just me, or is it happening everywhere? Is the economy turning south or what?” As I monitor the data from more than 200 practices each month, I notice patterns in other things, too. So, we combed this data to see what the year patterns actually were. This article outlines these patterns and their ramifications. What is your best month each year for establishing new patients? For many practices, it is August. It’s the back-to-school rush. October, February, March, and April also are fairly good new-patient months. Conversely, November, May, and June are slow new-patient months. What can you do with this information? First, don’t try to fight the seasons! For example, if you do a new-resident mailer, hold back the list of names in May, June, November, and December, then mail those names during later months. (Mail the May and June names in late July or early August. Mail the November and December names in January and February.) You might think it is better to advertise when you aren’t as busy, but you will fare better if you go with the flow. If you were in the restaurant business, you would not try to have your grand opening on a Monday night – you would have it on a Saturday night because that is when people want to go out. If you plan a direct-mail campaign, newspaper ad, flyers, or any other event, do it during good new-patient months. Also, look at your work hours. Avoid taking time off in August – particularly late August. Instead, plan your time off for months that are traditionally light for your practice. Again, would it make sense for someone in the restaurant business to take off Saturday night? Some offices even ask staff to not take time off during August. Plus, if you know of months in which you are less busy, why stress yourself out sitting around with a light schedule? Take a vacation. Also, if you plan on remodeling, don’t do it during one of your peak months. The simplest and best indicator of patient flow is total exams: recall, new patients, and emergency exams. 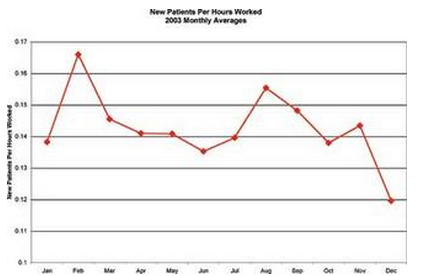 Again – August, October, November, and April are big patient-traffic months. May and September are lower patient-traffic months. What does this mean for your office, and how can you use this information to your benefit? During high patient-flow months, expand your hygiene capacity. Your hygienist could put in an extra day or two, or you can use more CRDA time in helping you with kiddie prophies or use assisted hygiene. If your practice calls for more patient check-ups during those times, then be ready. During months with lighter patient traffic, you and your hygienist should promote other services such as perio or bleaching. The hygiene schedule should be less hectic, and hygienists should have more time to focus on those issues. A practice grows (or shrinks) through its hygiene capacity. If you want to grow, add hygiene time every summer around July – perhaps a day or two a week. That will ratchet your practice up a notch. Then, in the late fall or early winter when there is less patient traffic, trust that the hygiene time will stick and you will keep things busy by providing perio and other services. The point is, add to your hygiene capacity during the high season because that will give you the best chance for success. 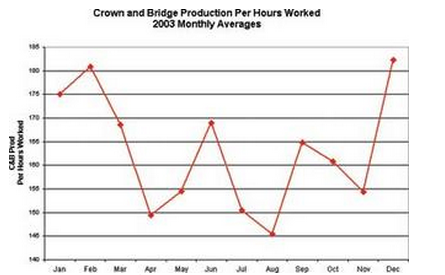 December, January, and February are the biggest crown and bridge months for most practices. This is due to dental insurance. Near year-end, people want to use their benefits, and many patients with fresh benefits want to use them the beginning of the next year. In the fall, send a letter to patients explaining that if they or family members have pending treatment, they should not delay. Many versions of this letter have been developed over the years, and we’ve displayed an example on the following page. Patients will appreciate the notice, and you will pick up a few extra cases. Also, let your staff know that November and December are high season for presentation of dentistry. Tell them to plan accordingly. You might want to hold some time open near the end of December for crown seats so you can get in under the insurance deadline. And, as you diagnose treatment in autumn and if the patients insist on waiting because their insurance has run out (and they won’t be budged into continuing until their benefits are fresh), then appoint them in January. Commit them to treatments so they don’t get lost between the cracks. Yes, I know that ideally you should not have to be dependent on insurance companies for case-presentation rhythms, but it does make a difference in everyday, normal practice, so accept it and plan accordingly. Your awareness that it is high season will help you prepare. If your practice is busy with crown and bridge in December, don’t make December your vacation month. 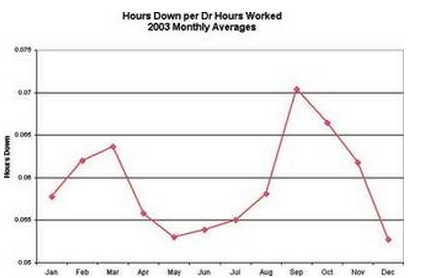 We adjusted data to the number of work days per month.) Some offices have a lot of returning college kids, and if that is true for you, set aside some time near the holidays so you can accommodate them. This will include hygiene time and maybe a little bit of follow-up operative time set aside so they can be treated quickly. Resort areas and agricultural communities have their own rhythms. In northern Minnesota, it is common for a community to be home to 5,000 people during winter and 10,000 people during summer. If doctors conscientiously plan their staffing, hours and time off will benefit. In agricultural communities, treatment and payment are factors. Farmers often will put off bills until the fall. In many country practices that is OK, but make sure in the fall that these accounts are paid off. You will want your front desk people to be on top of those collection accounts right after harvest. Agricultural community winters are ideal for farmers to come into your office, so recall them then. Keep an annual calendar to plan your year. It should take into account the seasons as aforementioned (your marketing programs, when to add to hygiene capacity, when to stress perio, crown and bridge, etc.). Plan for annual events such as performance reviews, staff outings, continuing education, in-service days, and CPR training. Doctors’ vacations should be planned well in advance so staff can adjust. Most offices don’t insist that staff take vacations when doctors do, but if you give them advance notice, you have a greater chance of their being able to. Why invent make-work while you are gone or work understaffed other times? This can significantly affect your bottom line. 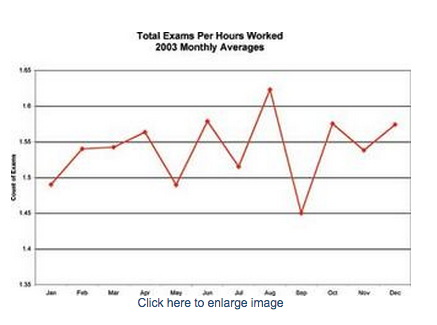 The rhythms of your practice may be slightly different than the data shown. Review your computer reports. Track new patients, crown and bridge, production, and exams during the past two or three years to find your rhythms. Do in-service routines during lighter seasons. Many times these are done on the spur of the moment or not taken care of at all. Doctors sometimes overreact by cutting back on their hygiene capacity or otherwise making inappropriate decisions in states of near panic. This can hurt practices. You can buffer the effect of the seasons. During low months, ask the staff to contact existing patients while you promote the practice a little less. Even though December, January, and February are big case-acceptance months, don’t give up on your efforts year-round. The majority of patients still don’t maximize their insurance benefits in any given year. This way you’ll feel less like you’re asking for help and more like you’re offering it. Many of my clients also encourage referrals by sending Dental Health Month mailers to patients, and they pick up an extra month or two worth of new patients. To get the best results, don’t wait until February; start planning your Dental Health Month promotions now! Plan for and work with the seasons. Doing so will help you make more and worry less. Most insurance companies have a year-end deadline for benefits. Therefore, if you or your family members have been postponing any dental treatment or check-ups, it would be to your advantage to have the treatment completed before the end of the year. Please call our office today so we can reserve a time for you. In preparing for a new year, many employers offer a benefit of setting aside pretax dollars for medical and dental needs. We would like to offer our services to you in estimating for next year. Give us a call if you have any questions on your future dental treatment. If you have no dental needs at this time, great! We’ll see you during your next check-up visit. P. S. Please don’t wait until the last minute to call! Our schedule is already filling up with the end-of-the-year rush. We look forward to hearing from you soon. The author wishes to thank Dr. Bruce Trimble and Sharon Walbran for their technical support during the writing of this article. Bill Rossi is the president of Advanced Practice Management in Minneapolis. He and his staff are actively involved in the ongoing management of more than 200 upper-Midwest dental practices. For more information, you may reach Rossi by phone at (952) 921-3360 or via the Internet at www.advancedpracticemanagement.com. 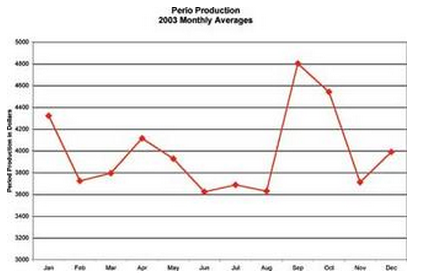 This entry was posted in Dental Practice Management, Marketing for Dentists and tagged Seasonal dental marketing on September 8, 2013 by Bill Rossi.